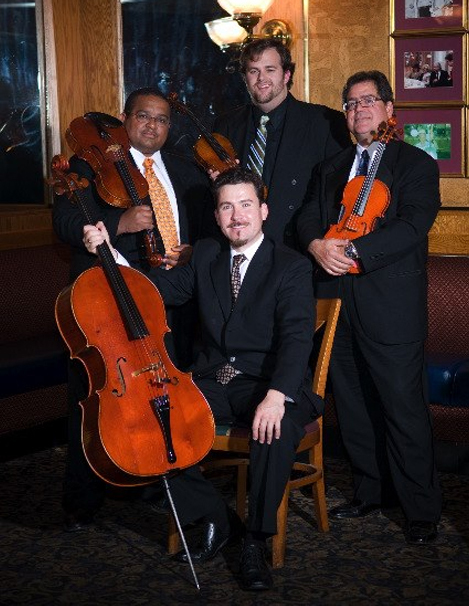 Philadelphia String Quartet :: Professional, String Quartet in Missouri, MO wedding ceremony music. Check your dates, String Poets is currently booking weddings and events in Missouri for 2018 & 2019. Missouri String Quartet, String Trio, String Duo, Violinist, Violin, Cellist, Cello, Guitarist, Guitar or Pianist. If you are looking for a string quartet in Missouri, String Poets is your best choice. Our group is willing to travel to Missouri or any location across the US or around the world. String Poets provides music for your wedding ceremony, corporate event, birthday pary, concerts and more. our wedding musicians will add the perfect touch to your event in Missouri. Thank you all for making this memorial service beautiful and memorable for all who attended. It is impossible to express one's thanks when there are so many sensibilities to take into account on such an ocassion. Your musicianship and the intelligence of the selections made the day for us all. And thank you for co-ordinating with the organist, Jeffrey Workman, and for working with me. I received your name from Robert Saladini, by the way, for whose father you performed a memorial service. He himself is an organist, and he praised your work. I am so grateful. Adrian Birne. I could not have been more pleased with the String Poets Quartet! They sounded beautiful, were professional, and they were extremely grateful to have been a part of the ceremony. I had quite a few special request and they performed them above and beyond what I could have ever expected! "Great to work with, fantastic professional musicians. We could not have asked for a better quartet at our wedding." The String Poets Trio that performed at our wedding reception was exceptional. They were extremely professional, incredibly talented and not only met but exceeded our expectations. They were fabulous and I would recommend them to anyone. They provided a beautiful musical backdrop to our wedding reception. Bravo!!! We would like to say thank you for being part of our day. It was amazing. Do you want to be notified about New Events? Join our email newsletter. It's fast and easy.